It is a rather morbid statistic that the Georgia State Patrol keeps but it is helpful to keep track of, and that is the number of deaths on Georgia Highways during a holiday. For the just completed Thanksgiving Holiday, that unfortunate number is 19. This is an increase in the number of highway deaths from last year’s total at this same time of 13. There were also another 263 injuries from Georgia motor vehicle wrecks this year, down from 303 last year. 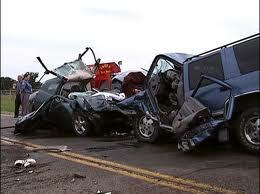 Almost all of the fatal crashes involved either speed, alcohol, or the victim failing to use a seat belt. The Governor’s Office of Highway Safety (GOHS) hopes these statistics and their efforts “will encourage responsible driving practices, and create safer roadways throughout the communities. With this information it is our hope that individuals and organizations work to reduce the number of motor vehicle crashes that occur yearly on Georgia roads and highways.” You can find more helpful information at http://www.gahighwaysafety.org/. In my plaintiff’s personal injury law practice, I deal with death of someone’s loved one on a daily basis. I know that each of those 10 killed represents a loving family missing a beloved family member and I know that family is grieving over their loss. My heart goes out to each and every one that they may receive comfort and healing.